Cranberries growing in my garden in a container! 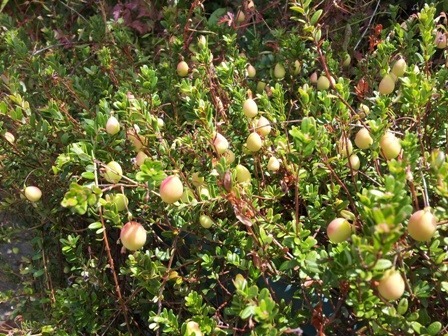 Cranberries (Vaccinium macrocarpon) are native to northeastern North America. and grow in swamps and bogs. They are a low-growing, trailing woody evergreen perennial with small oval leaves that grows along the ground and forms a dense mat. Berries are produced on short vertical upright branches, known as uprights, which grow from the long trailing runners that run along the ground, though some berries grow on the ends of the runners. Cranberries produce bright pink flower in spring, which are pollinated by bees. The berries ripen in autumn, where they turn a dark red colour. The easiest way to propagate cranberries is by layering, just push part of the trailing branches (runners) partly below the soil, and they will take root, then they can be cut from the parent plant and transplanted. Since cranberries are members of the Ericaceae (Heath) family just like blueberries, they like acidic soil. In their natural environment, cranberries grow in a moist sandy with organic matter, but not waterlogged. They grows best in acidic soil with a pH of around 4.5 and prefer full sun to part shade, with protection from frost. Patience is required when growing cranberries, as they only fruit after 2-3 years of growing. Many gardeners try growing them and give up thinking that they haven’t got soil conditions right. How do you recreate the complex soil environment that cranberries grow in? Some gardeners dig a shallow bed in their garden, line it with plastic that has some drainage holes, and fill it with a potting mix for acid loving plants to simulate a moist but well-draining bog environment, and water it frequently to keep the moisture levels up. I’ve found a far easier solution, which works very well, as you can see from the pictures in this article! The really simple way to grow cranberries is to use a large self-watering pot, I prefer the long trough-shaped self watering pots, often called ‘planters’ or ‘window boxes’. They have a water reservoir at the bottom which holds a few litres of water, which wicks upwards and keeps the soil moist. A self-watering pot is basically a sub-irrigation system (which simply means ‘watering from below the soil’), it’s an old technology which has been used extensively for growing indoor plants, and has seen renewed popularity recently in it scaled up version of a ‘wicking bed’ which gardeners use to grow vegetables. To create the acidic environment, I fill the container with a potting mix designed for acid-loving plants, such as an azalea & camellia potting mix, and I add an appropriate measure of a slow release acid-loving plant fertilizer (slow-release azalea & camellia fertilizer granules) in spring an autumn to feed the plant. I prefer to elevate the self-watering pot to allow the trailing branches to drape down, as this keeps the plant tidy, and away from the hot concrete ground where it sits, but if you want to allow your cranberry plant to spill over into the garden, by all means do so. Even though self-watering pots don’t need topping up often, the whole process of watering can easily be automated if you wish. All my plant containers are connected to a trickle irrigation system which uses adjustable irrigation outlets on a plastic spike, these are placed into the potting mix or soil medium, and adjusted to match water flow to the size of the pot. This whole watering system can be connected to an automated irrigation timer for truly low effort gardening. In conclusion, it doesn’t take much work to grow cranberries. Just keep the water reservoir of the self-watering pot topped up, feed at the start of spring and autumn, sit back and let the plant grow. In around two years, you will be rewarded with your first cranberries! 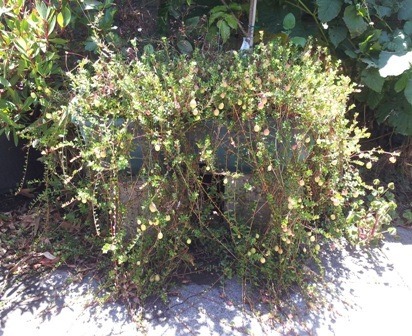 This entry was posted in Gardening Information and tagged cranberry growing requirements, cranberry propagation, growing cranberries, self-watering pots. Bookmark the permalink. Thanks Angelo! After touring your mind-blowing garden last year I decided to have a go at cranberries too. I have 1 growing in my wicking box but Ill try layering it to see if I can get it to self propagate. I can’t wait to see them when ripe. This is great news. I’ve used fresh cranberries when living in nth america. I’ve been to your garden – so respect! Love your work. Where could I get some now I know how? Thanks for the comments from both readers who have commented here, great to hear you enjoyed visiting my garden! Many of the sustainable garden nurseries around Melbourne that stock lots of wonderful edible plants such as BAAG and CERES stock cranberry plants. Hi! Great Blog! is there a way to subscribe via email? Notifications of updates on this site are via RSS feed, not email. I’ve wondered about growing Cranberries for some time now but never see them at any of the Nurseries for sale. I do remember hearing that they can be aggressive so your potting them up might be wise. Would look beautiful growing off deck rail boxes. Great idea planting them in deck rail boxes, they drape down very nicely! I would like to try planting them on my farm. What are the requirements?